a. Two for one ice cream cones on Monday b. Two for one Ice Cream Sodas on Tuesday c. A Nano Deal for Wednesday. A flight of 5 nano cones for $3 (save $2) d. Two for one Floats on Thursday (Root beer, Orange, or Dr. Pepper) e. Senior Citizens Discount: 10% off ice cream for Senior Citizens. f. Rainy Day Special: 20% off ice cream and 10% off everything else while it rains. What Free stuff from Lofty Pursuits do you like the best? a. 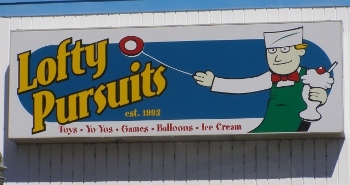 A Free ice cream sundae at Lofty Pursuits on your Birthday (Make sure your bring ID) b. Free Lofty Pursuits button with any purchase c. Our Free Coupons E-mailed to people on the mailing list at LoftyPursuits.com and for those who follow us on Facebook and Twitter. What Regular event at Lofty Pursuits is your favorite? a. Game night 6 to close on the Fourth Friday of the Month. b. Swing Dancing in the Pavilion from 2-4 the First Sunday of the month. c. Yo-Yo Club every Saturday at 1pm. What is the favorite things served when we cater parties from the Lofty Pursuits Ice Cream Bus or our Portable Soda Fountain Cart?